The 2018 North City Jazz Walk will take place on Tuesday, August 14, 2018 beginning at 6:00pm. 15th NE will be closed to vehicle traffic from NE 175th to NE 180th for the event. 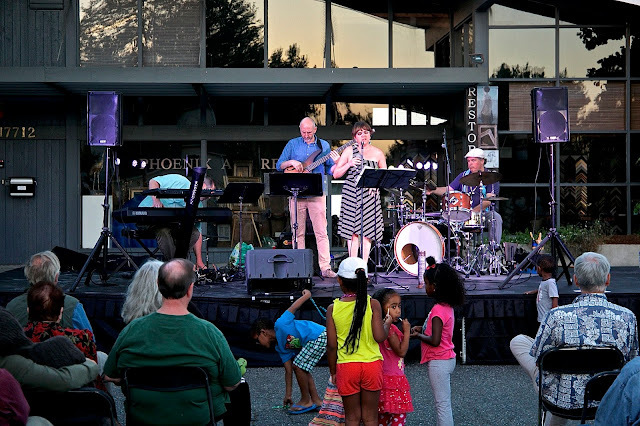 City of Shoreline staff serve a thriving, friendly city where people of all ages, cultures, and economic backgrounds love to live, work, and play, and most of all, call home. As a public water district founded in 1931, North City Water District serves approximately 25,000 people on the east side of Shoreline, as well as portions of Lake Forest Park. Ronald Wastewater is a special purpose district focused on the operations and and maintenance of a sanitary sewage collection system, from the corporate limits of the City of Shoreline (excluding The Highlands) and parts of unincorporated Snohomish County, as well as a portion of the Town of Woodway, the City of Mountlake Terrace, and the Highlands Sewer District. Bethel Lutheran Church is always searching for a stronger connection to the love of God in our lives and a means to share it with others. Printing Plus provided all of the printing services for the Jazz Walk, and can provide virtually any printed product imaginable to communicate with your clients, employees, stockholders, or vendors. Samantha Arango is a residential real estate broker with Windermere Real Estate assisting buyers and sellers in Shoreline, Washington. Specializing in real property matters. The Snow Group is your go-to team for all things North Seattle Real Estate with over 36 years of experience helping buyers, sellers and investors. Rallie Jamero helps you protect not only what you have today, but to also prepare for tomorrow, with services that range from insurance to financial security. A Northwest Dental’s team of top dentistry experts provide customized dental services and exceptional treatment. North City Business Association is the voice of businesses and business owners in the heart of Shoreline, Washington. Their goal is to provide a strong voice and presence in the decisions that will affect the future of the North City commercial district and neighborhoods. Brad and Kim Lancaster provide legal services in probate, wills and trusts, elder care issues, and divorce mediation and collaboration.